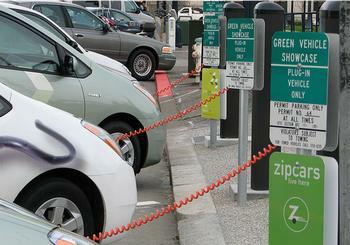 LOS ANGELES, California, May 17, 2011 (ENS) – The Obama administration is growing a nationwide network of electric vehicle charging stations fertilized with economic stimulus funds. More than 1,800 electric vehicle chargers have been installed across the country to date under the Obama administration’s economic stimulus law, the American Recovery and Reinvestment Act, Energy Secretary Steven Chu announced on Friday. Coulomb Technologies, ECOtality, General Electric and others have been installing the charging stations as part of the Obama administration’s investments in U.S. electric vehicle manufacturing and alternative vehicle infrastructure. “President Obama has set an ambitious goal of putting one million electric vehicles on the road by 2015,” Secretary Chu reminded the audience. Since President Obama took office in January 2009, the Energy Department has invested more than $5 billion in grants and loans to spur the growth of America’s electric vehicle and advanced battery manufacturing industry. These investments are supporting U.S. manufacturers and small businesses as they expand to better compete in this fast-growing global market. Chu said the eight projects under the Transportation Electrification Initiative, including Coulomb’s project, represent the world’s largest electric vehicle demonstration project and will result in the deployment of over 13,000 grid-connected vehicles and over 22,000 charging points in residential, commercial, and public locations nationwide by December 2013. In addition to establishing 4,600 EV charging locations nationwide, Coulomb’s project includes the deployment of electric vehicles, including 2,000 Chevy Volt, 200 Ford Transit Connect, 100 Ford Focus EV, and 100 Smart EV vehicles. “ECOtality has worked closely with EV Project partners to ensure that we deliver charging stations to meet market demand for EVs well in advance of vehicle delivery,” said Jonathan Read, chief executive of ECOtality. “We have focused initially on residential installations to ensure first adopters have the best possible user experience as the majority of charging most likely will take place at home during off peak hours. “The electric vehicle charging equipment market is in its formative stages, and business models are still developing as vendors gain experience with charging station deployments,” said senior analyst John Gartner. Gartner said that Coulomb attained the highest overall score in the Pike Pulse report due to the companys successful technology partnerships, global sales network, and extensive product portfolio.